Africa is my soft spot and I am always excited to go back, regardless of the daily challenges (electricity breakdown, water cuts, limited internet connections, blazing sun, dust, rutted roads, chaotic public transportation, misunderstandings, poor infrastructures, Kafkaesque situations…) that leave me perplexed or upset. But at the end of the day I am happy to be here. I like the simplicity, the ingenuity, the generosity of the people I had met. I always come back refueled with a greater sense of what is important: live in the moment, family and community come first, there is always a solution. This time my African adventure is taking me to Namibia starting alone with a road trip to the Namib Desert. Yes, alone. 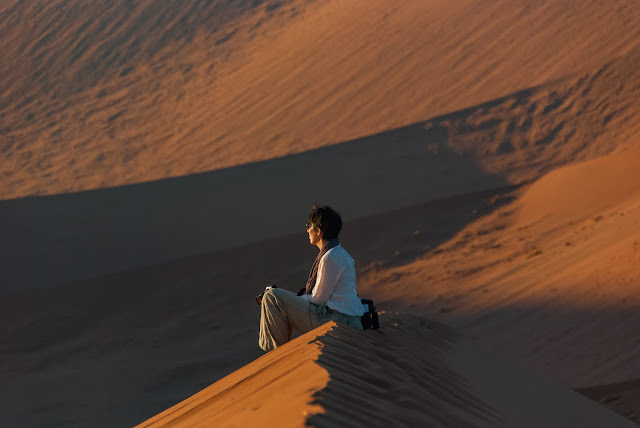 I am going to drive about 1,200 kilometers round trip to see the beautiful sand dunes in the Namib Desert. Everything can happen. The best as much as the worst. Is that safe for a woman to travel alone in Africa? What if you get a flat tire? What if the car get stuck in the sand? What if you get lost? What if… Everything can happen and I will be just fine. So here I am at Windhoek airport, after 24h spent in planes and airports to get here. Nonchalance, dry heat, dusty horizon, stony hills. This is Africa. As part of the Ebola monitoring, another medical form to fill up. My partner in adventure is going to be a Nissan X-Trail 4x2. Now seating at the wheel, not feeling very bold. I think this car is almost twice the size of my petite Peugeot. I have butterflies in the stomach. I look left. I look right. The epic road trip starts at this very moment when I hit the B6 towards Windhoek where I will spend the night. 40 kilometers to go. The road goes through a flat and mesmerizing landscape with only dust and bush for as far as the eye can see. The sky is dramatic. So when the sun is starting its descent it is absolutely stunning. The last rays of light pierce thick dark clouds and the horizon is incandescent. I get overwhelmed with feelings of peace and freedom. Only a few cars every now and then remind me I am not the only witness of this raw beauty. There are as well some warthogs popping up, prancing about along the road and disappearing as fast as they appeared. This is going to be an unrivaled journey. Once at the hostel it did not take me very long before I meet my new fellow travellers for the next days. 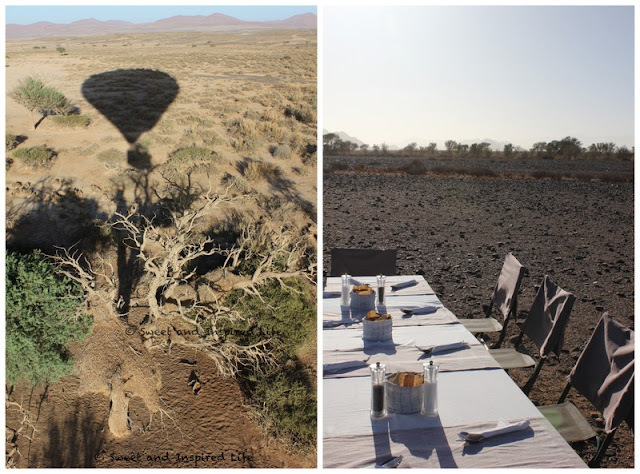 Who doesn’t want to go to the Namib Desert? We agreed on an itinerary and set a departure time for the next day. This morning the headline on Sky News is the poisoning of lions in the Masaï Mara, caused by shepherds who wanted to protect their cows. Some claim that this illegal action will harm the reserve and so the tourism industry; against those whose survival depends on their herd. Cinnamon pancakes for breakfast and we left. 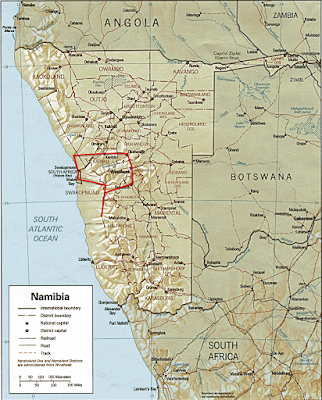 We first head east towards Swakopmund. One of us suggested to make a detour and pass by the Spitzkoppe, nicknamed the Matterhorn of Africa. So we did. This 1728m high sharp peak rises miragelike in the dusty plain of Damaraland. Very dusty plain. Sometimes we stop and there is no one but us marveling at this unlimited and wild space. Sometimes we stop and a horde of kids pops up from nowhere, runs to us laughing out loud for a gift, money, some attention or satisfy their curiosity. Overnight at Swakopmund, a surreal remnant of the German colony. This blend of German and African culture on the African continent is like an anachronism to me. It feels weird. We inflate again one of our breathless tires and start our driving through the Namib Desert. The journey itself is worth the destination. Hours of driving on an arid land with mind-blowing landscapes from infinite dusty plains to rocky hills and a few cactus. The tourists mass together by the Tropic of Capricorn sign for a selfie or group photo to immortalize their passing. The locals – zebras, ostriches, and antelopes - don’t seem to pay attention to our visit. They ignore cars, and the dust that comes along. Solitaire. What an interesting place. A settlement lost in the open desert. Our tire is still breathless. 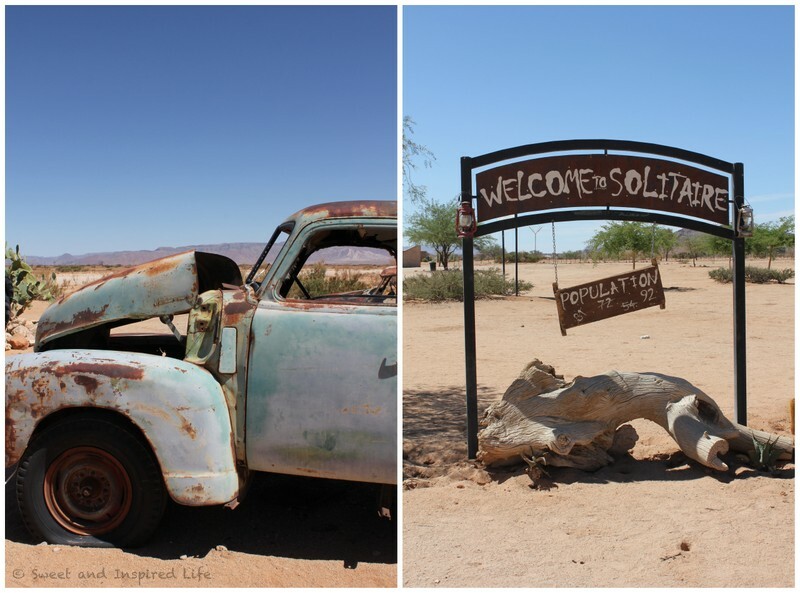 Are we going to make it to Sossusvlei, our final destination? I had no choice but to share my giant chocolate chip muffin with the birds. Probably more birds in that place than the number of inhabitants, unless they are the inhabitants. Very hungry ones. On our way back I went for the giant apricot jam sandwich biscuit, whose both ends were dipped into chocolate. They tend to bake extra large pastries in this small place. This time I shared with this little squirrel. It is a squirrel, right? Yes, I think it is. Right on time to check in at Sesriem, the gateway to the sand dunes of Sossusvlei. Can’t resist the beautiful chalets facing the silent and mysterious desert plain, so no camping for me tonight, and not either tomorrow night. I am spoiling myself! The next days are going to be all about marveling and wandering in such an inspiring place. How long did we stay on the top of the Dune 45? I don’t know. When we started to slide back to the car the crowd had left, running to the next dune. We stayed there another moment still hypnotized. Sorry for the profusion of pictures, but this place is really special. And no words or pictures can actually describe how it felt to have witnessed that sunrise. We all felt very privileged to be there. And the show is not over. Next is the Dead Vlei, part of the Namib-Naukluft park. Another inspiring place, where you can contemplate for hours and feel at peace. This clay pan was once a shallow pool. Now this is how it looks like after the climate changed and the trees died. 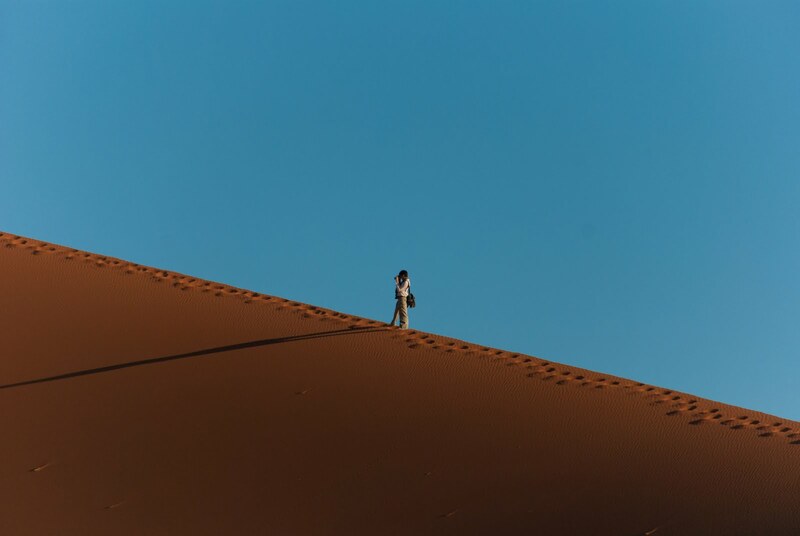 But do not stay too long after noon though as the sand become so hot that you take the chance to caramelize your feet and/or bottom depending on how you decide to slide down the sand dune. I speak from experience here. That day was our last day together. We shared a last sunset, exchanged email addresses and said goodbye. Some would go back to Windhoek, some would head south, other would decide as the day goes. Hard to leave such a place so I decided to extend my stay for one more night. Now I want to see the sand dunes from a different angle: high up, from a hot air balloon. Breathtaking. Only the breath of the balloon disturbs the silence, when the pilot insufflates more heat in the balloon. Soft landing and champagne breakfast in the middle of nowhere. Time to head back to Windhoek. I got my breathless tire fixed. I got some food and water for the way in case the desert would not let me go. At the exit gate the guard introduces me to Junius. He works at the lodge I was staying at and needs a lift to Windhoek. All right, let’s go! “Oh, and one of your friend is waiting for you at the petrol station…” he added. Very pleased to see him again. More time to philosophize and set the world to rights between two daydreams. Now we are good to go, so let’s go! Time is flying when the company is good. I’m already back to Windhoek to pick up my sister at the airport. 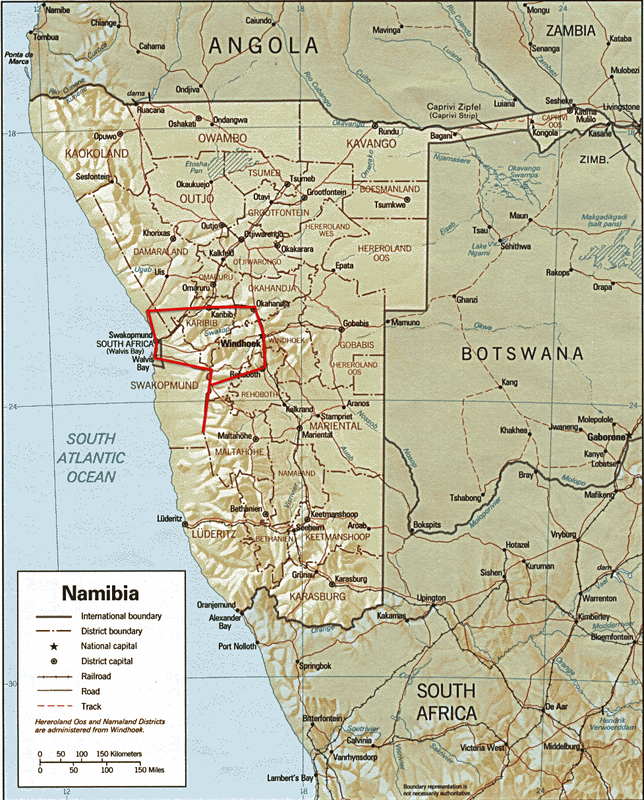 We are going to explore the north to meet up with the Himba tribe. Everything can happen; my sister is a serious adventurer. Are you ready? I love your images and so admire your courage! Thank you for this beautiful post. Thank you! Courage is all within us, I believe it is a matter of shuttering our fears... just jump into the water, it is never that cold.